An illustrated Timeline of American constitutional history. 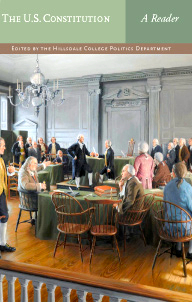 The key Debates between the Founders, the Progressives, and others. A database of Quotes drawn from the Reader. The Topics that are most important to understanding American government. Once again Larry Arnn and Hillsdale offer a priceless resource for only the cost of time, leaving US citizens no excuse to be ignorant of the first principles and founding documents that define and uphold our Republic and our liberty. I implore everyone to take full advantage of the video courses in conjunction with The Constitutional Reader: this is a splendid opportunity to truly know The Constitution, a second chance to fully grasp the founders’ vision of a Republic replete with individual liberty and responsibility. Thanks Michael…Hillsdale & their Kirby Center liked it!